The Namib Desert is said to be the oldest desert in the world. It shapes the patterns of the driest country in Sub-Saharan Africa. Namibia is a sparsely-populated country of vast and beautiful desert landscapes. But it is by no means a barren or desolate country. It is home to a great diversity of plant and animal species, many of them endemic to its ecosystems. 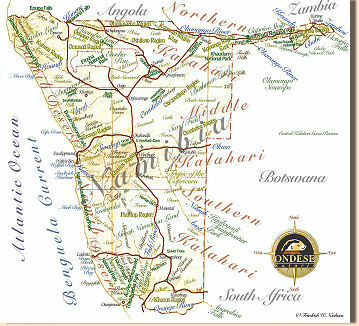 The country's rugged and varied topography includes the forbidding Skeleton Coast, the vast Etosha salt pan, the swamps and rivers of the Zambesi Region in the Caprivi as well as one of the deepest canyons and the highest sand dunes in the world. Bushmen with legends of the great hunter-gatherers still alive in their memory; businessmen, farmers and entrepreneurs of European origin. Namibia is diverse as few other countries: swamps and deserts, elephants and golden moles, welwitschias and baobabs, vast spaces and friendly people.